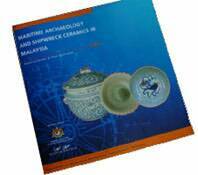 MARITIME ARCHAEOLOGY AND SHIPWRECK CERAMICS IN MALAYSIA. Soft cover, 64 pages, 95 coloured photographs, numerous sketches. To order: contact Pacific Asia Museum, Pasadena. After finding, excavating or investigating seven ancient shipwrecks, the company assisted the National Museum in Kuala Lumpur to establish an exhibition showcasing artefacts from the shipwrecks. This exhibition is commemorated in a special exhibition catalogue. 38 pages, photographs and black and white sketches. 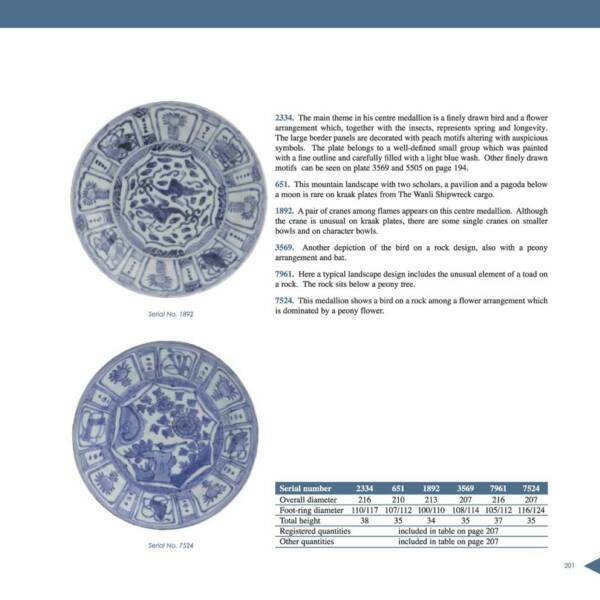 Draft report: Royal Nanhai and its Ceramic Cargo. Written by Sten Sjostrand. This book is written by the company’s principal researcher; Sten Sjostrand. It provides the background for his discovery of ten historical shipwrecks and their excavation. A lifetime’s experience with sailing and naval architecture allows Sjostrand to bring new understanding to ancient ship construction and allows him to set the ships and their ceramic cargoes in historical perspective. 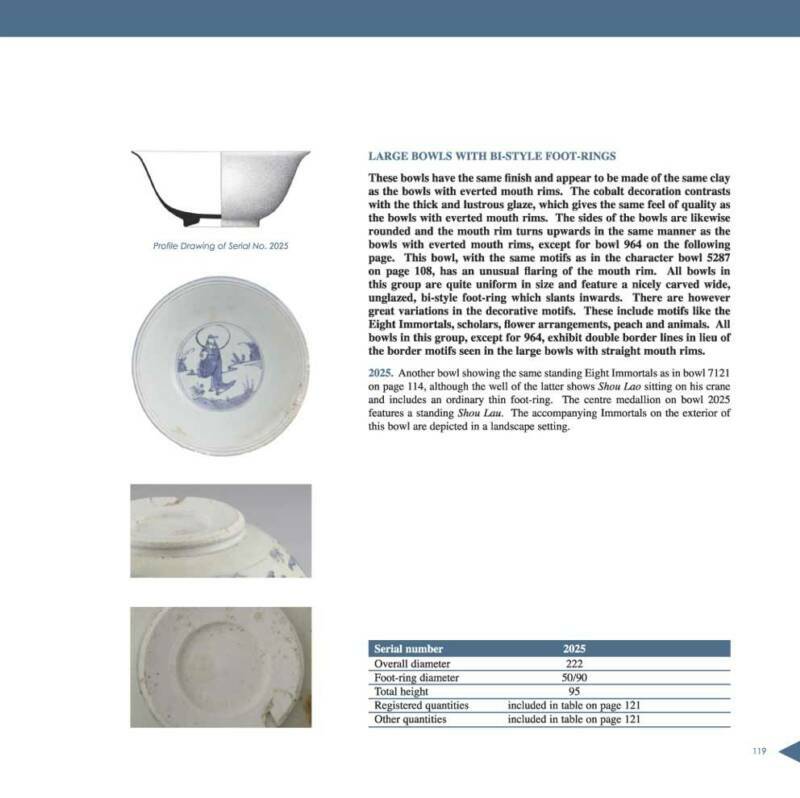 With ceramics from the 11th to the 19th century, Sjostrand proposes a chronology of wares not available earlier from precisely dated ‘time capsules’ sites. Each of Sjostrand's ten shipwrecks, their cargo composition and detail of the ships structure is presented in this unique "coffee table" book. 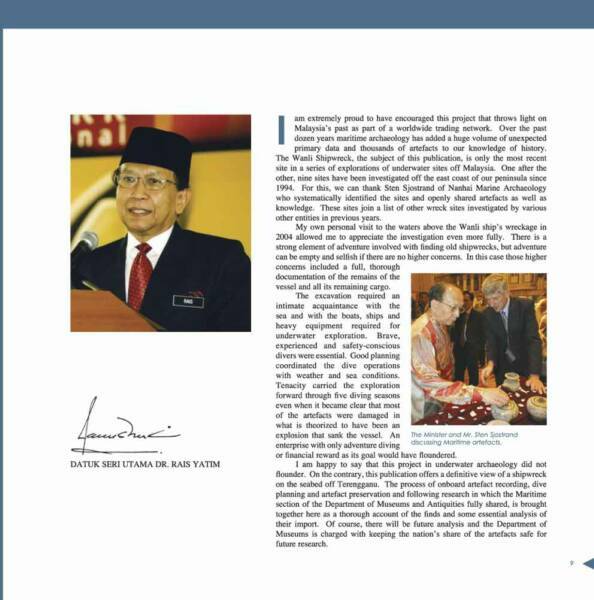 Malaysia's Minister for Culture, Arts and Heritage; Datuk Seri Utama Dr. Rais Yatim was kind enough to write the Foreword praising present archaeological achievements and providing hopes for continued success. team, and his venture into shipwreck excavations. the information from his discoveries. bring new understanding to ancient ship construction, and his voluminous reading allows him to set the ships and their cargoes in historical perspective. This publication delivers the sort of precise data that will stand the test of time and be mined by future scholars for studies to come on Asian history. 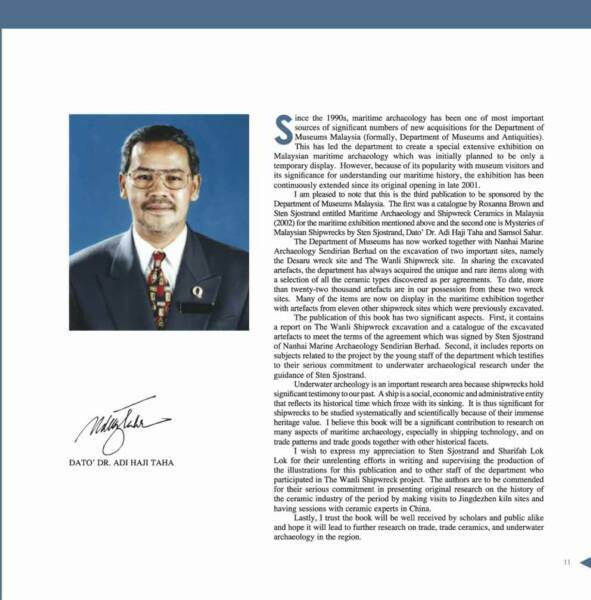 The thoroughness displayed in this catalogue is a testament to his passion and devotion to mapping ancient maritime trade and trade goods during more than two decades of dedicated work"
This publication sets new standards for the reporting and analysis of shipwreck sites in Southeast Asia. Its two most important elements are a full accounting of the archaeological excavation itself and then an inventory of the artefacts recovered. 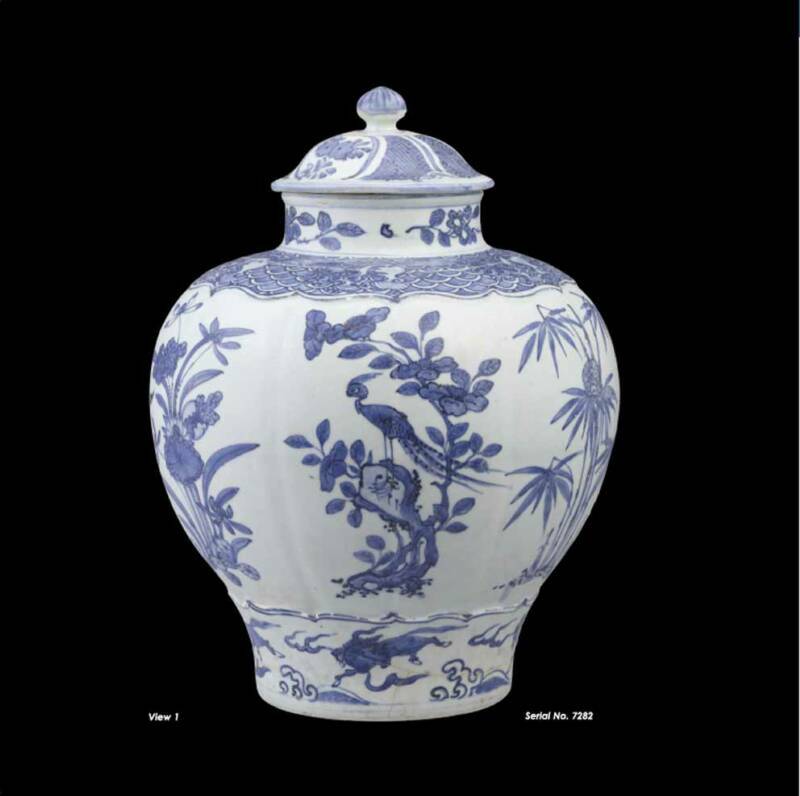 Significantly, the artefacts include a major cargo of some 37,000 pieces Chinese kraak porcelain that the authors (after thorough analysis) assign to +/- 1625. 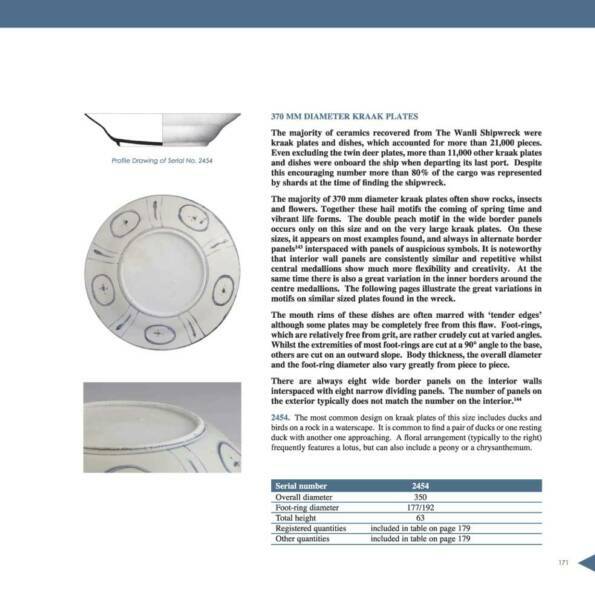 The solid archaeological context for the ceramics adds significant new data to studies of 17th century ceramics that now requires previous studies be reviewed and refined. 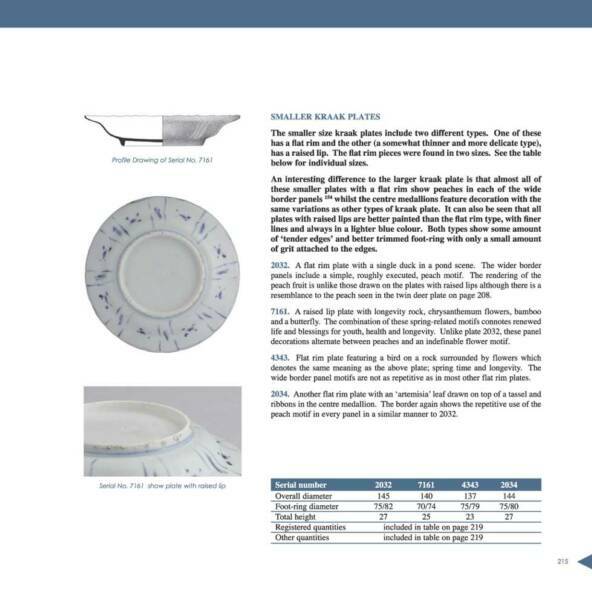 Besides 650 full color illustrations, there are drawings, maps and illustrations of the site, both ceramic and non-ceramic artefacts, and ship parts and fittings. 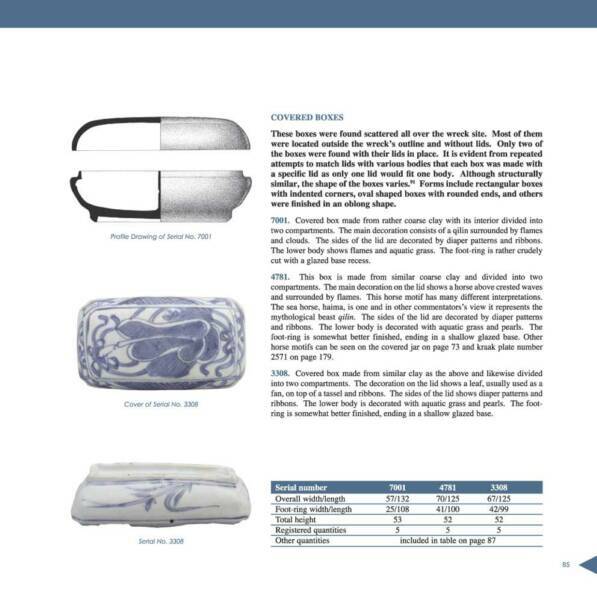 One section systematically reviews the symbolism of the blue and white designs, and another gives the historical background for their production in China. 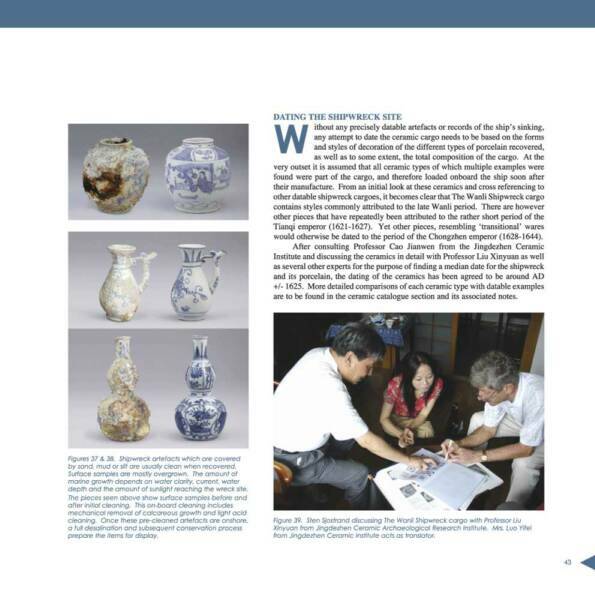 The report documents a fruitful relationship between Malaysia’s Department of Museums and Sten Sjostrand of Nanhai Marine Archaeology that began in the early 1990s. The excavation of The Wanli Shipwreck in Malaysia’s territorial waters is only the latest chapter in their joint efforts to illuminate history through projects in maritime archaeology. The accumulated details of this shipwreck site reveal a surprising and explosive history – the date, the historical circumstances, the mounds of shattered porcelain associated with broken and missing hull planks lead intractably to the theory that the vessel was a Portuguese-managed ship that sank in a sea battle with Dutch forces that were seeking to control the port of Melaka. 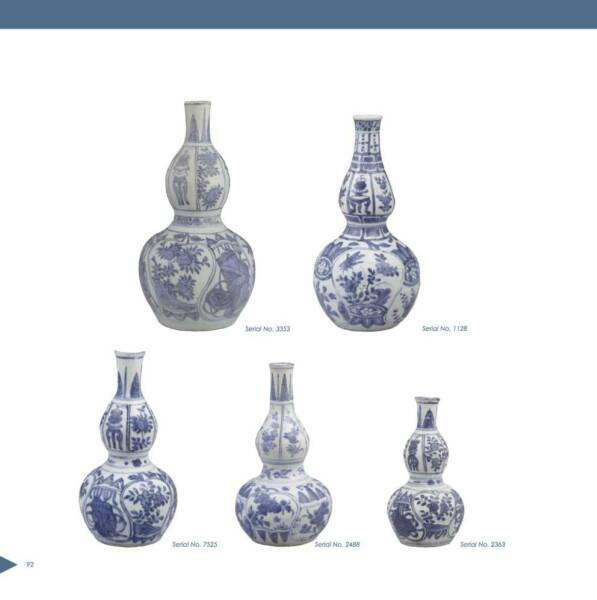 The artifacts sold on this website are therefore legally and properly excavated and can be supplied with an export permit from the Department of Museum in Malaysia should this be required. This unique working arrangement makes us one of the few Internet sellers that sell from own excavation and issues a meaningful Certificate of Authenticity with every artifact with a serial number. 27 X 27 cm, 360 pages. More than 650 color photographs, sketches, tables and maps. High quality (150 gm) paper.Total weight of the book is a hefty 2.5 kilo !! It is marvellous and unique. Congratulation. I guess special books are only written by special people! 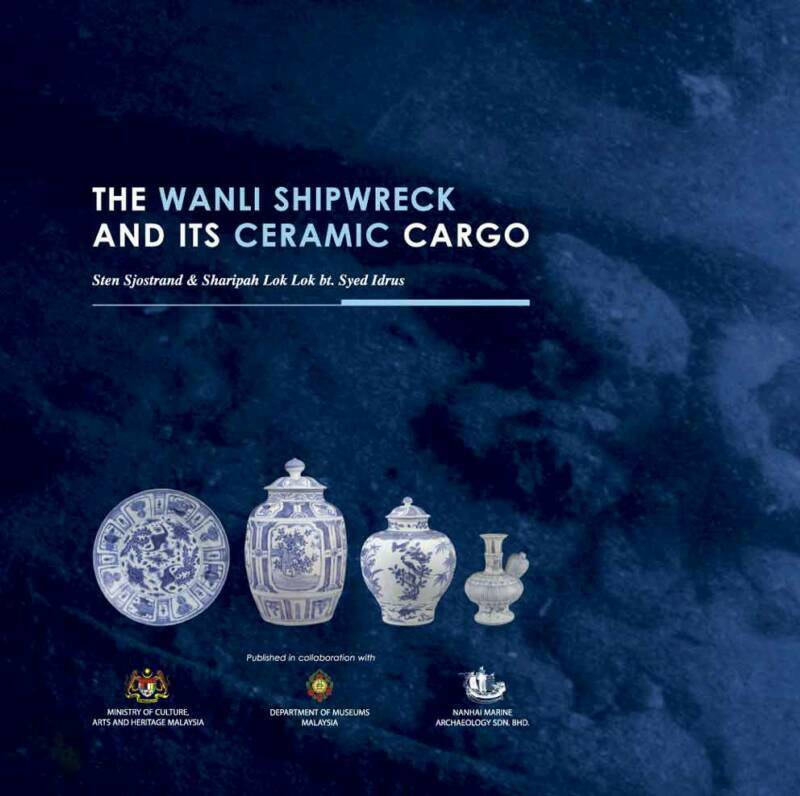 THE WANLI SHIPWRECK AND ITS CERAMIC CARGO by Sten Sjostrand and Sharipah Lok Lok bt. Syed Idrus, published in 2007 by Nanhai Marine Archaeology Sdn. Bhd. in collaboration with the Ministry of Culture, Arts and Heritage Malaysia and the Department of Museums Malaysia. Designed by E-Magineers (M) Sdn. Bhd. 360 pages. 650 full colour illustrations. 4 maps. Bibliography, Index. ISBN 967-9935-74-4. US$80 (hard cover). At first glance, it seems like a coffee table publication but you cannot judge this one by its cover and size. 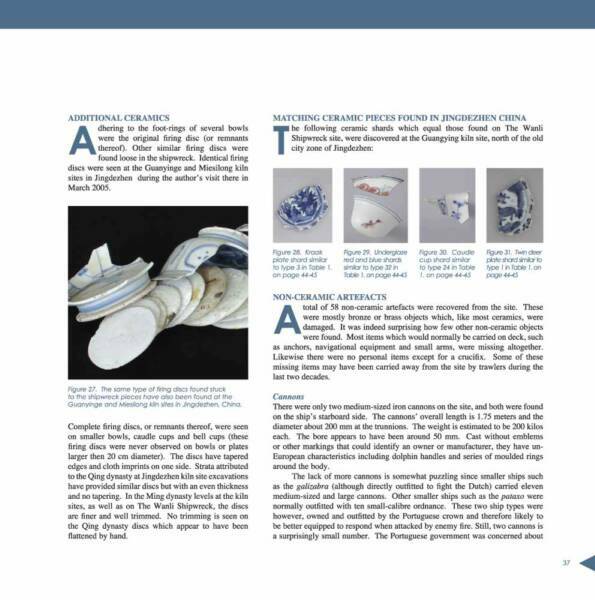 A heavy tome and obvious labour of love, this 360-page book is about the 17th century porcelain laden shipwreck salvaged in Malaysia off the shore of Terengganu state near Tenggol island in the South China Sea from 2004 to 2007. 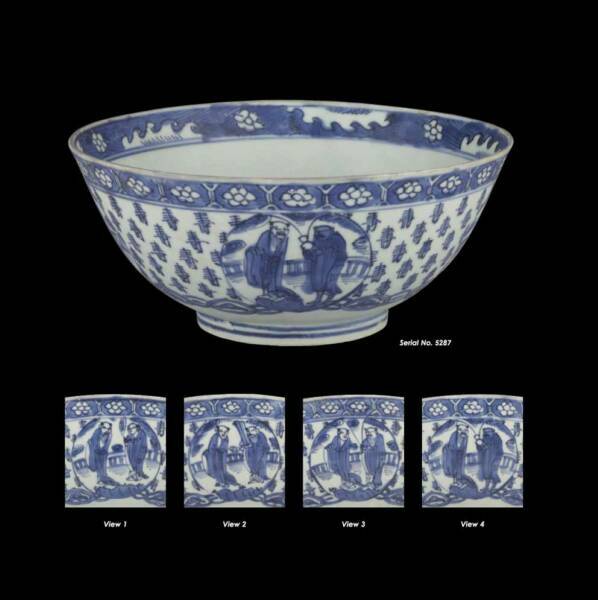 According to the book, the Portuguese had acquired the chinaware and pottery cargo at their Chinese enclave in Macau before the ship set sail for Melaka (Malacca) or Batavia (present day Jakarta) around the year 1625. An ill-fated voyage, the ship never arrived at its intended entrepot destination. Sunk in battle, it laid buried in the seabed until found almost 400 years later. Being a complete cargo from its point of origin adds to its importance as a perfect time capsule of 17th century trade goods exported from China. The main author, Sten Sjostrand of Nanhai Marine Archaeology, is the principal figure behind the series of 10 undersea excavation of old shipwrecks dating from the 11th to the 19th centuries in various regions of Malaysia over the past 20 plus years. Credited as his co-writer, Sharipah Lok Lok bt. 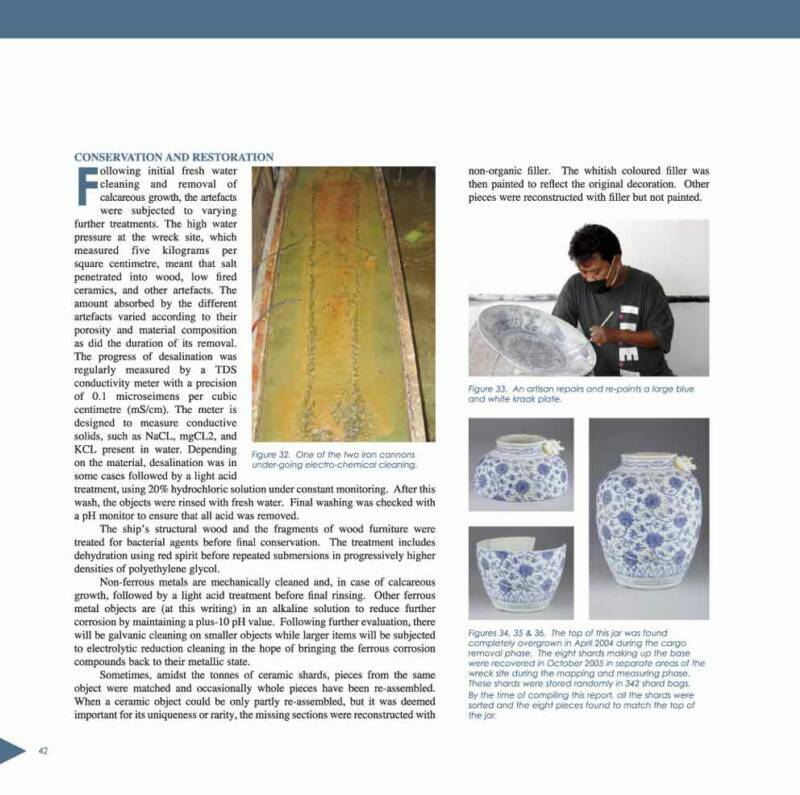 Syed Idrus from the Department of Museums Malaysia, had assisted him in the Wanli shipwreck project. After two decades of sifting through his accumulated research notes and records, mariner turned archaeologist Sjostrand has produced a remarkable publication. The results impress as a landmark work of investigative study and scholarship based on empirical input and marine archaeology. 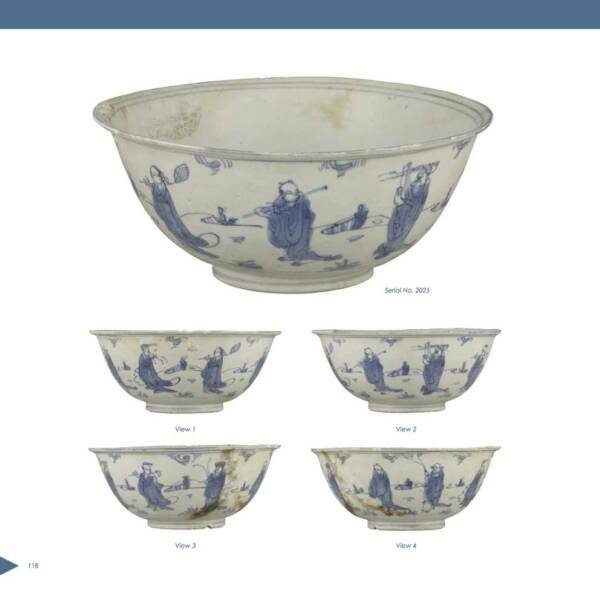 Not only does the book shed new light on late Ming ceramics, particularly kraak wares made for the European market, it also sets a standard for which all other similar shipwreck excavation attempts will be benchmarked in future. 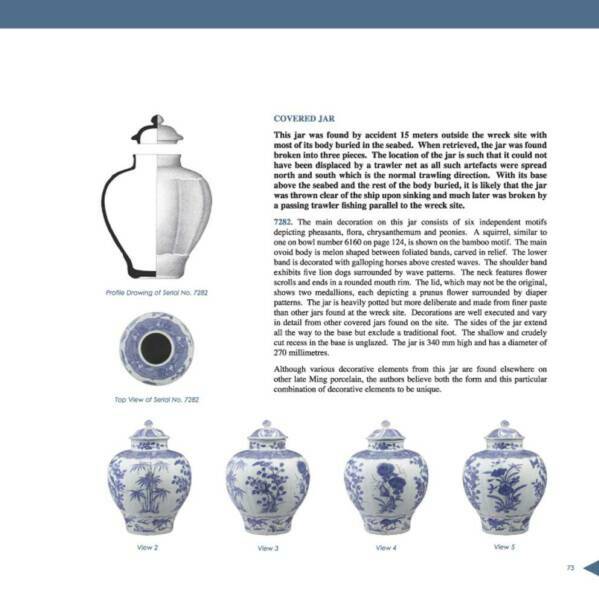 In her introduction on the book’s back cover jacket flap, Roxanna M. Brown, director of the Southeast Asian Ceramic Museum at Bangkok University, Thailand, who is a noted expert in ancient trade ceramics, lauds the full accounting of the archaeological excavation and the inventory of the recovered artifacts which the authors date to circa 1625 after thorough analysis. In her view, the new data means that all the previous studies of 17th century Chinese export ceramics will have to be reviewed and refined. 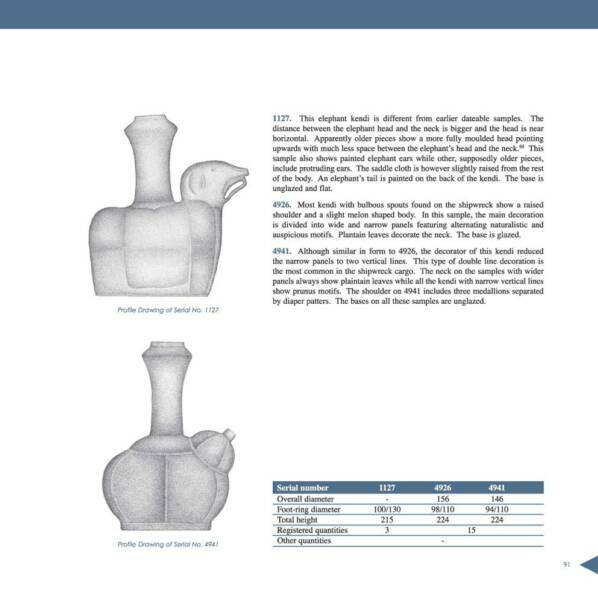 Throughout the book, ample illustrations accompany the reports, documentation and cataloguing of the shipwreck’s hoard. 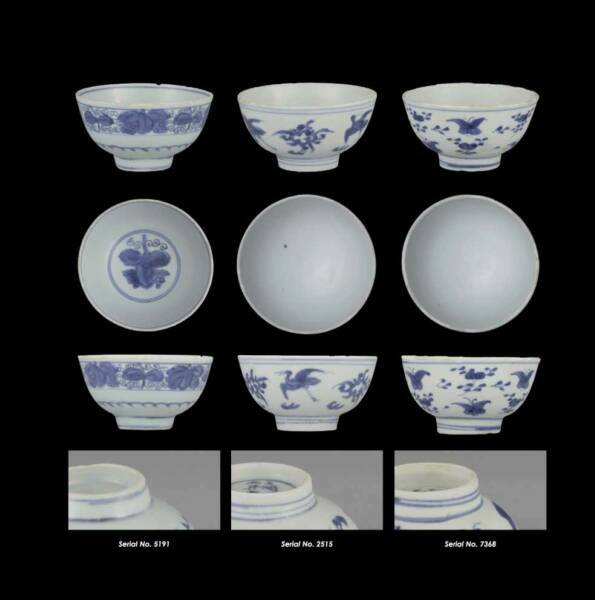 Four different maps identify the wreck location, kiln and raw material sites in Jingdezhen, porcelain transports through China’s inland rivers and recently discovered kiln sites in Jingdezhen. 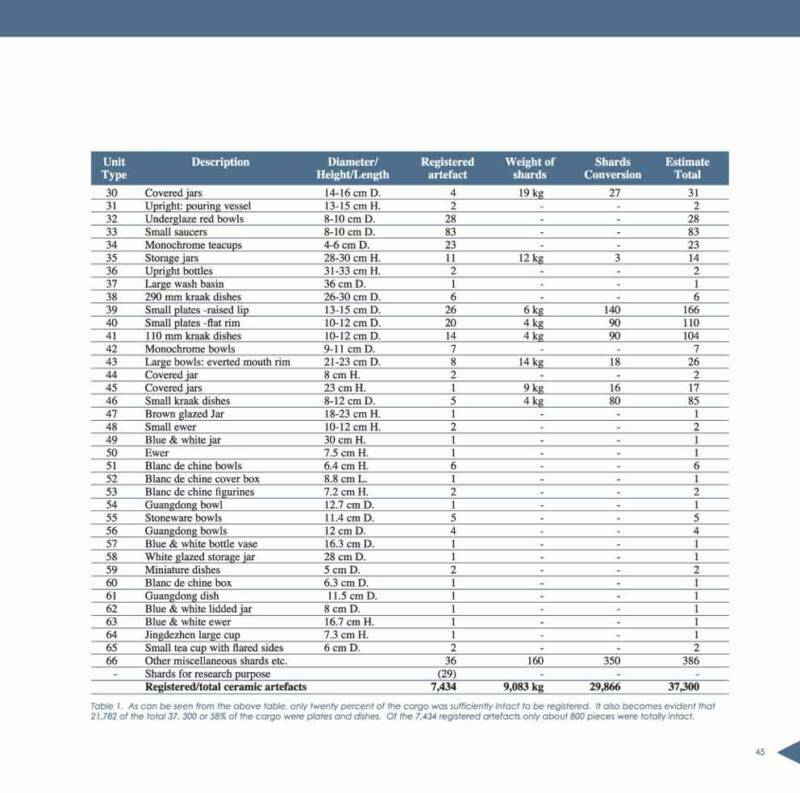 A tabulated table summarises the 7,434 items of artifacts including 9.083 kg of shards leading to an estimate of 37,300 pieces of ceramics that were in the sunken cargo. Lavish photographic spreads depict the variety of ceramic wares ranging from baluster jars to kendis, bowls, ewers, plates and bottles. Black and white sketches and line drawings capture the in situ state of the wreckage and describe the hull, keel and joints. The meticulous studies show the painstaking methods of records collected and compiled with passion and devotion. 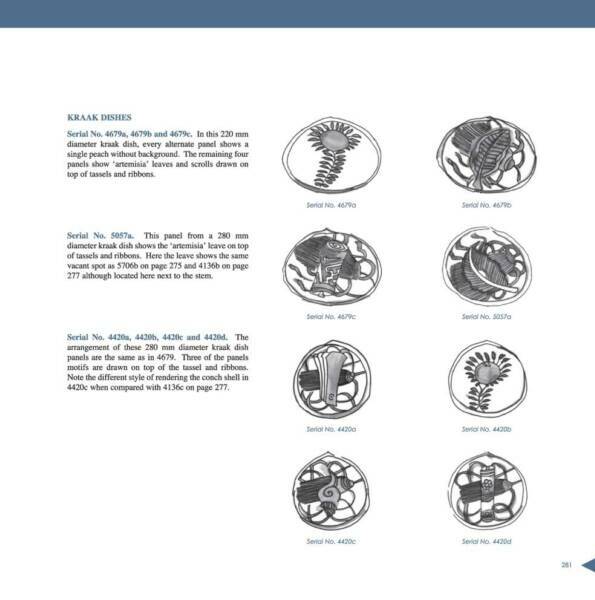 The book’s core contents are presented in five parts. Under “Archaeology”, the first part, Sjostrand suggests with sketches, drawings and political history how the Portuguese ship was blown up by its rival trading power after an encounter at sea. The incident damaged more than 90 per cent of the precious cargo. 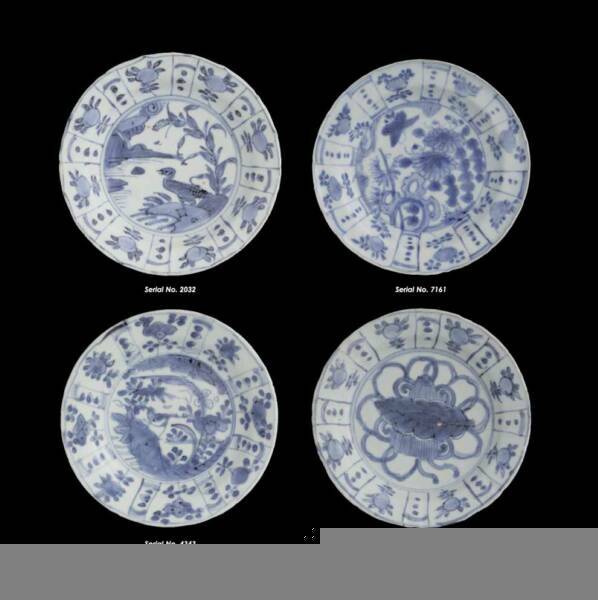 From tables and proper recording at the excavation site, he notes that the Wanli shipwreck cargo is the first intact cargo ever found before it could be sorted out for distribution in Southeast Asia. Had the ship reached Melaka, its likely destination, the porcelain cargo would have been divided up for re-directing to other Southeast Asian and European ports, making it impossible to say what the ship had originally carried from China. He focuses on the marine archaeology such as site conditions, pre-disturbance survey phase, cargo removal phase, artifact registration and handling, mapping and recording phase and the recording process itself. His training and experience as a marine engineer enables him to fully explain the shipwreck’s structure, timber, overall size, cause of sinking, shipbuilding and principal wreck arrangement. 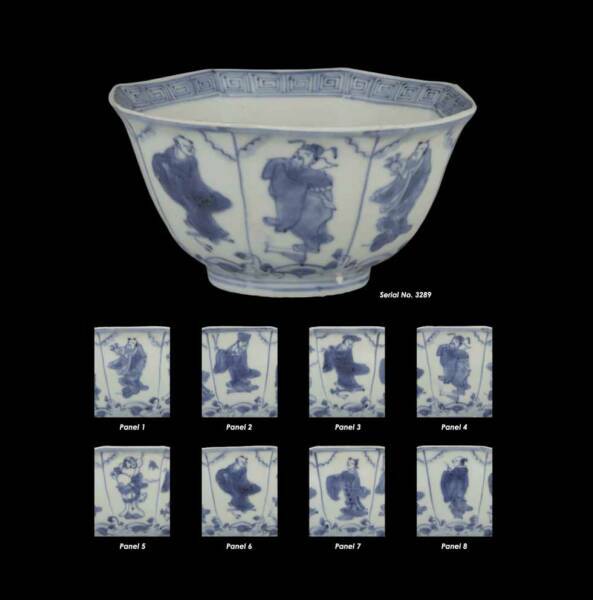 All the salvaged cargo comprising kraak porcelain, Wanli period (1573 -1620) blue and white ceramics and non-ceramic items are detailed along with the conservation and restoration efforts and shipwreck site dating method. 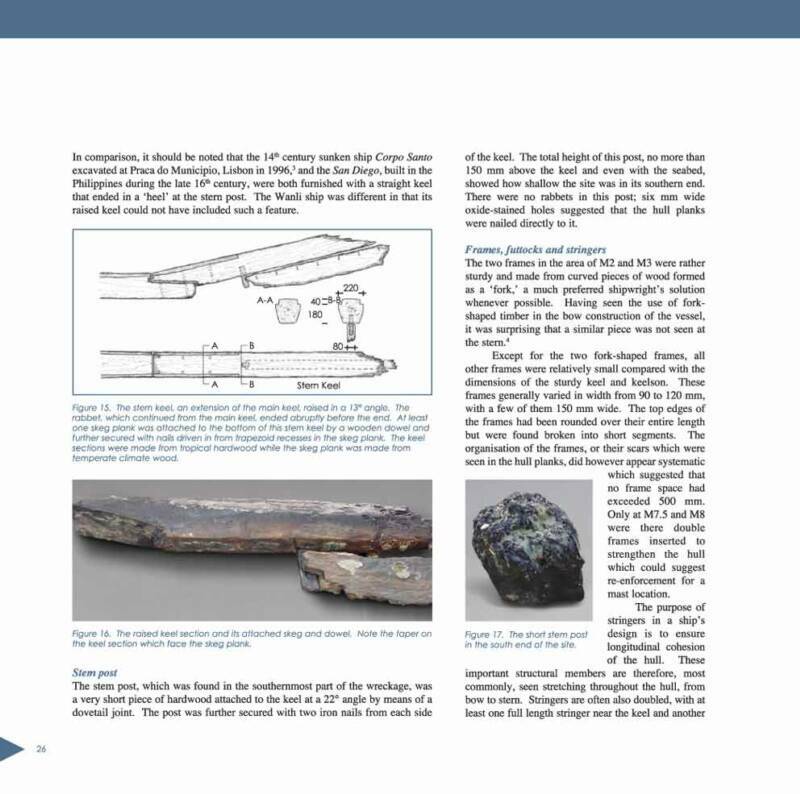 To satisfy the reader and pre-empt any questioning, the artifact sharing, museum participation and salvage diving history round up the wealth of information and data in Part One. 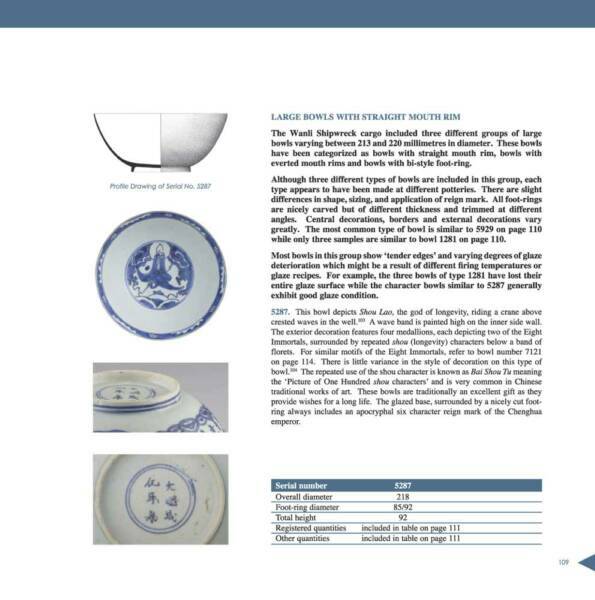 Part Two is the backgrounder and dwells on Jingdezhen as the ancient and most important porcelain centre of China. 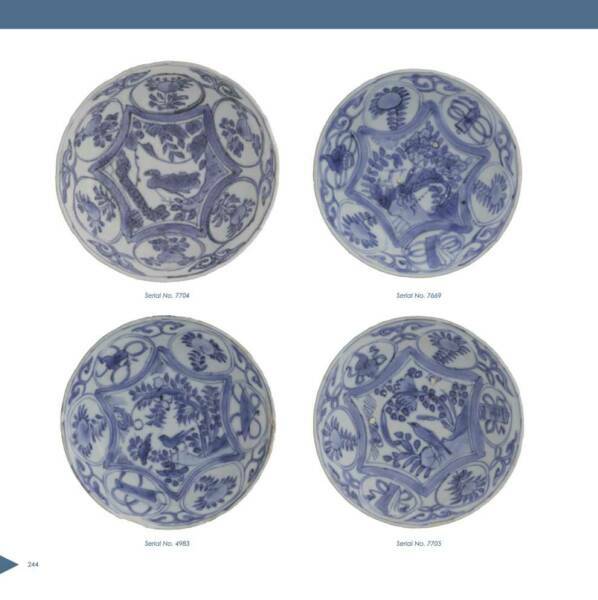 Based on their field trips to Jingdezhen to understand the manufacturing process of blue and white ceramics, the authors then relate the Wanli cargo to the original source of production. 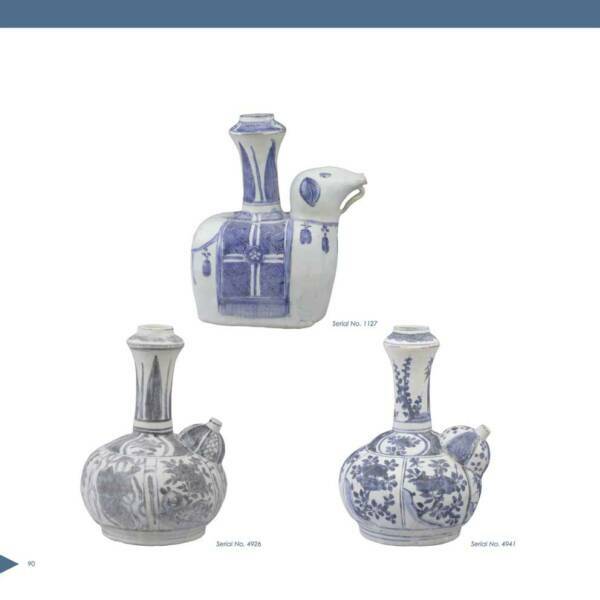 Insightful backgrounders on the 17th century merchants from Portugal and Holland elucidate the craze for and profitable trade in blue and white export wares in Europe. 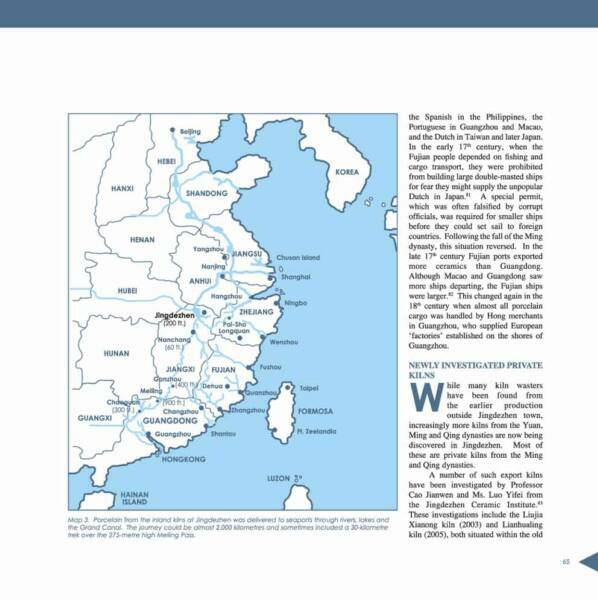 The transportation routing of Jingdezhen ceramics to southern Chinese ports is also discussed. 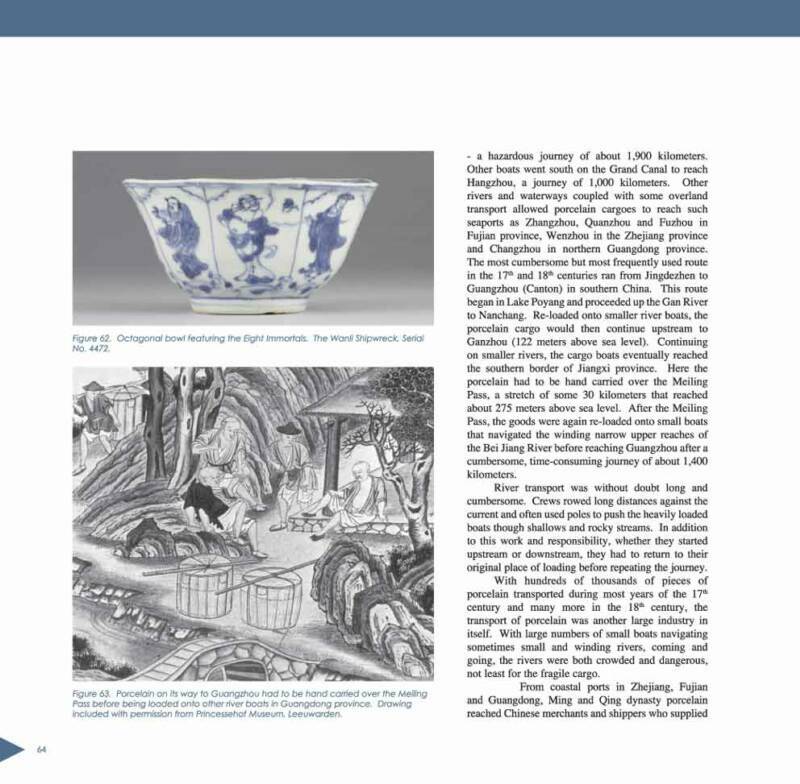 This section ends with a commentary on the newly found private kilns in the Jingdezhen area. 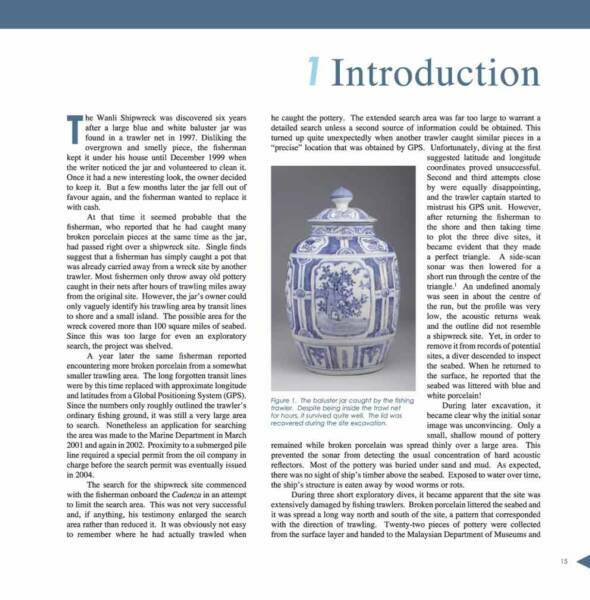 The lengthy ceramic catalogue in Part Three, which forms the welcomed bulk of the book, is a tour de force of research and study on 17th century Chinese porcelain. Art collectors, dealers, museum curators and scholars stand to benefit much from the visuals and texts therein. 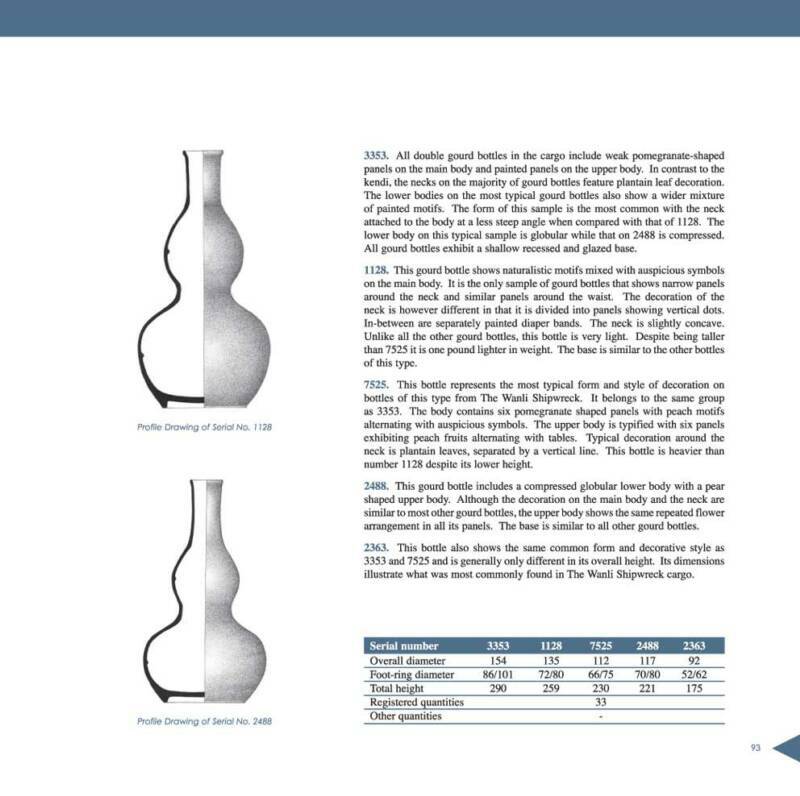 By concentrating on the variety of excavated artifacts, the authors provide factual tables of the ceramic types found in the shipwreck. The full colour overview and close-up photographic images spread generously over 188 pages deserve special mention and attention. 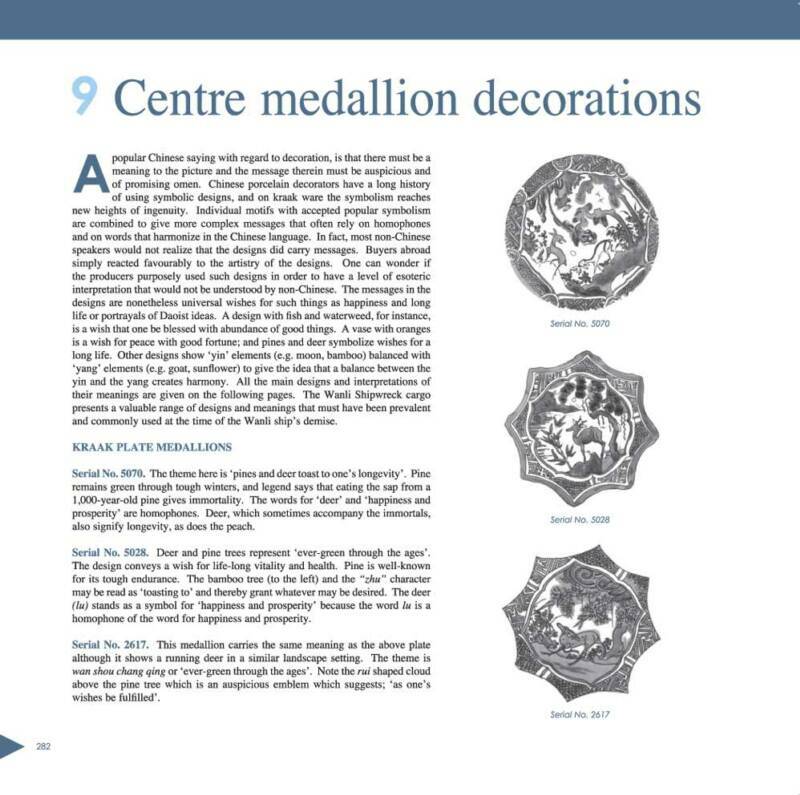 Pottery reign marks and inscriptions besides border panel and centre medallion decorations are also well illustrated and described, showing the academic thoroughness of the book’s documentation. 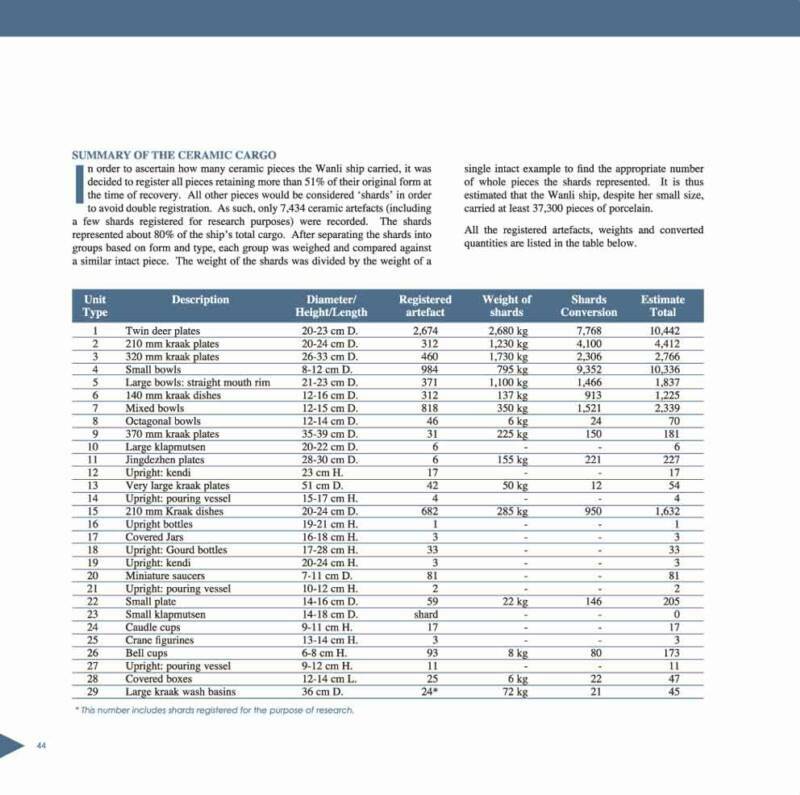 Part Four entitled “Endnotes” lists a total of 176 footnote type commentaries on individual pieces of the Wanli shipwreck cargo. Comparisons and contrasts are made to other known examples in private, public and institutional collections around the world. 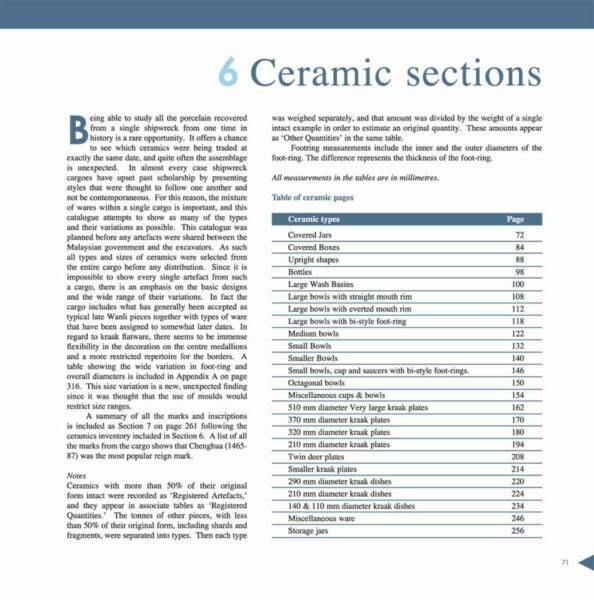 Ideas and opinions on decorative details and other potting features are offered to arouse the reader’s interest. 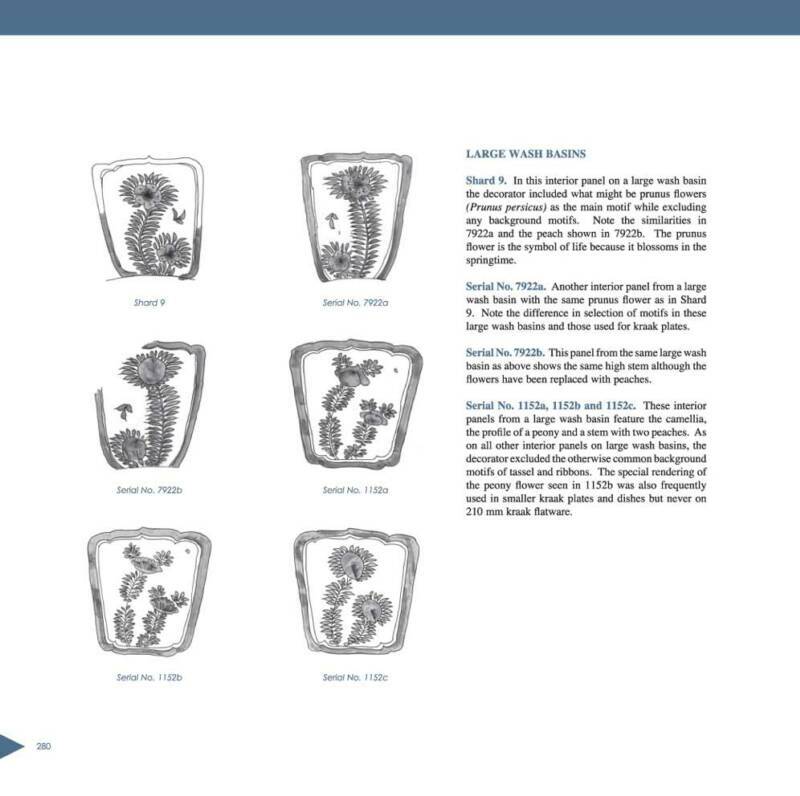 In Part Five, the appendixes provide comprehensive information about the whole project and many erudite details. 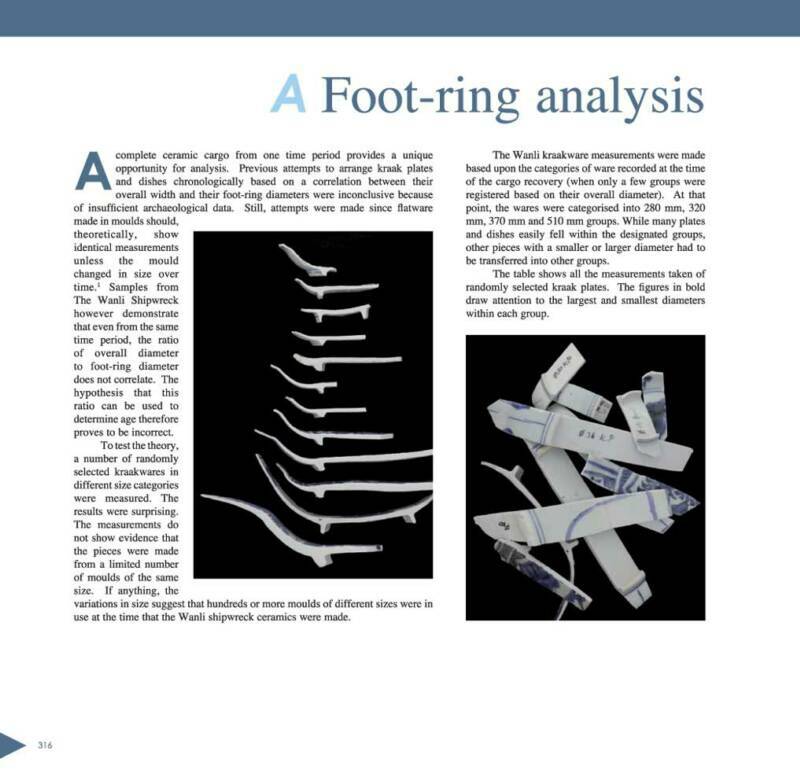 They cover ceramic foot-ring analysis, onboard typology listing, the reports of the Malaysian participants who were in the dive expeditions, analysis of large kraak plate joints, ballast and seabed material analysis. Last but not least, even the DNA analysis of bones recovered from the shipwreck is given. The book concludes with the usual acknowledgements. 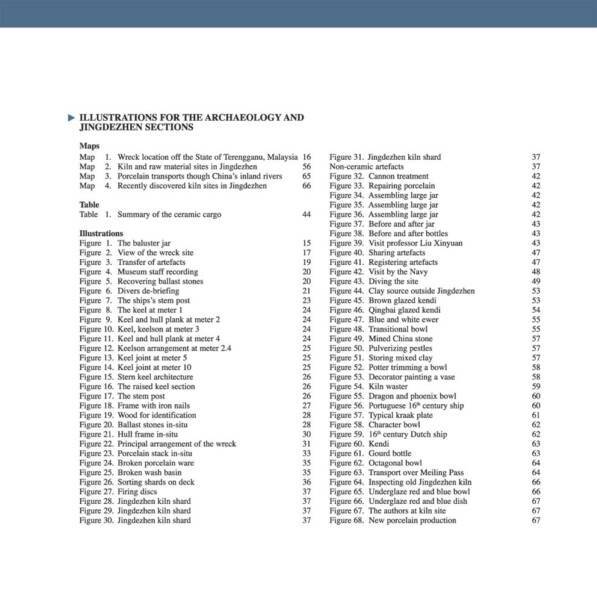 There is also a useful bibliography of notable references and an index of the topics mentioned by the authors. As a result, we now have a much clearer and better picture of the ancient maritime trade between the Far East and Europe as well as Chinese trade goods. 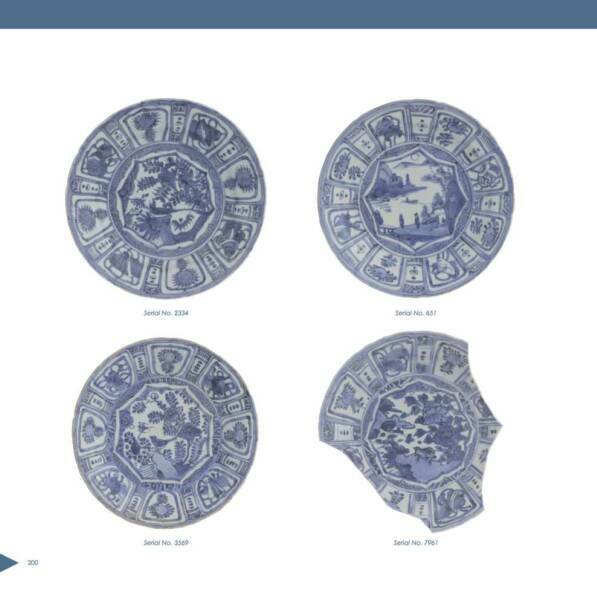 The Wanli shipwreck highlights the time when Chinese blue and white export wares resurged in the 16th and 17th centuries following the Ming gap shortages of the mid-14th to 15th centuries when the Ming imperial edict in 1371 forbade Chinese maritime merchants to venture beyond their shores to trade with the West and the rest of the world. 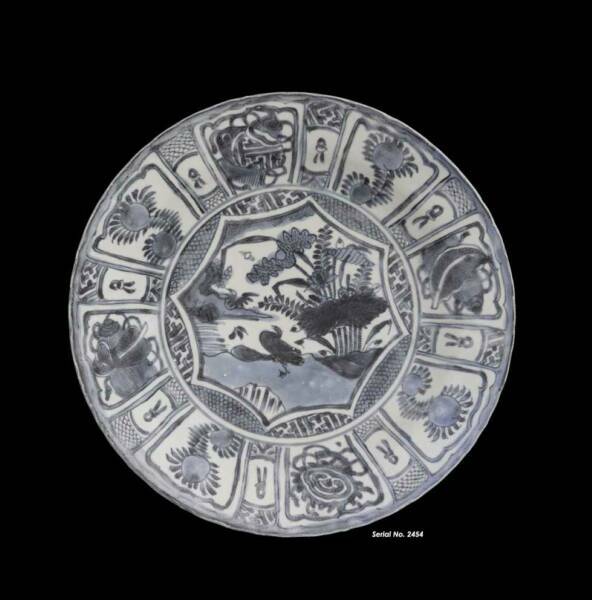 This self-taught expert and authority on antique Chinese and Southeast Asian ceramics, maritime history and undersea excavation learned everything through the school of hard knocks after he developed a greater interest in the topics following his relocation to Malaysia in the 1970s. Sjostrand's earlier publications lay the groundwork for this latest achievement. 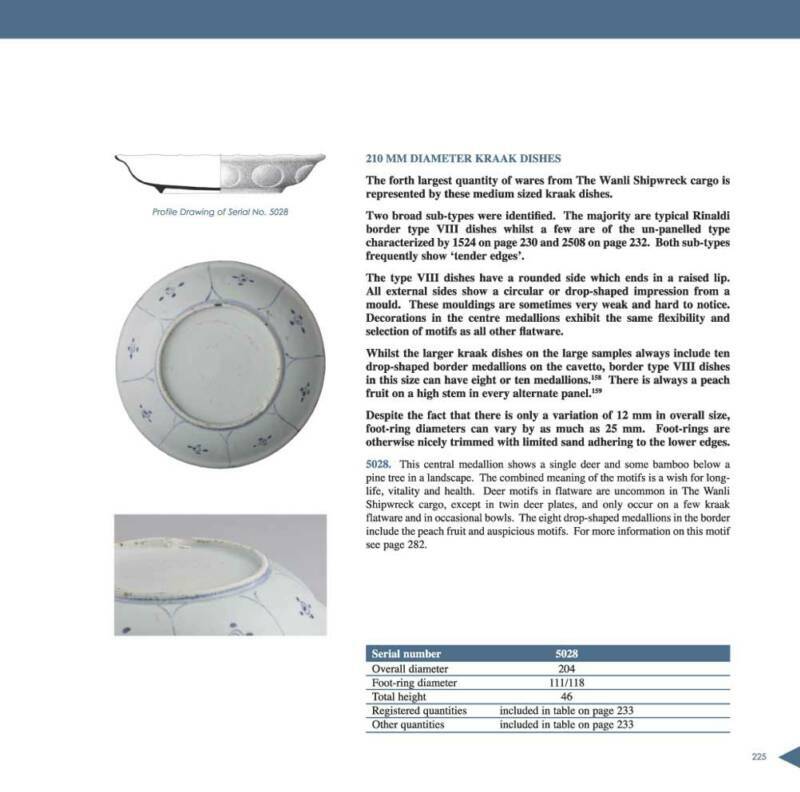 An 118-page exhibition catalogue, Maritime Archaeology and Shipwreck Ceramics in Malaysia (ISBN: 967-9935-16-7) which he co-authored with Roxanna M. Brown was published by the National Museum, Malaysia in 2002. 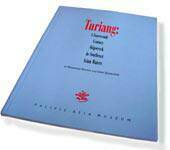 A 64-page monograph, Turiang: A Fourteenth Century Shipwreck in Southeast Asian Waters (ISBN: 1-877921-17-3) also co-written with Roxanna M. Brown was published by the Pacific Asia Museum, Pasadena, California, USA, in 2000. Previously, he co-wrote with Claire Barnes a 38-page report entitled A Fourteenth Century Chinese Shipwreck Ups Southeast Asian Ceramic History published by the Malaysian Branch of the Royal Asiatic Society in Kuala Lumpur. 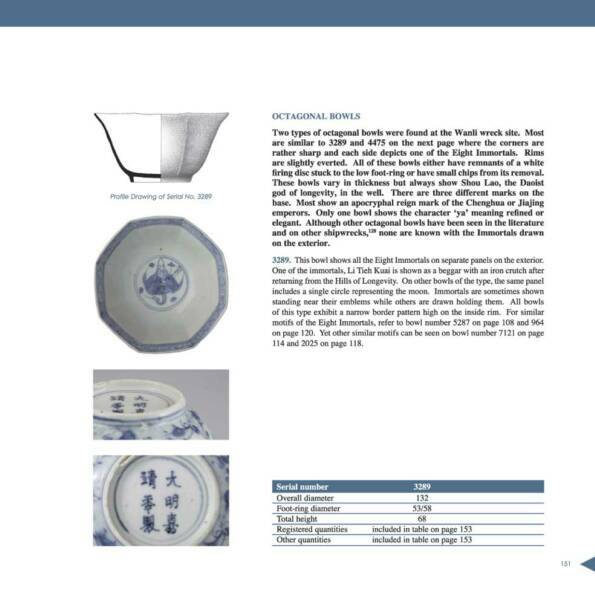 The draft report on another shipwreck he salvaged, Royal Nanhai and its Ceramic Cargo is available online at www.maritimeasia.ws. The 1997 summer issue of Oriental Art Magazine(Vol. 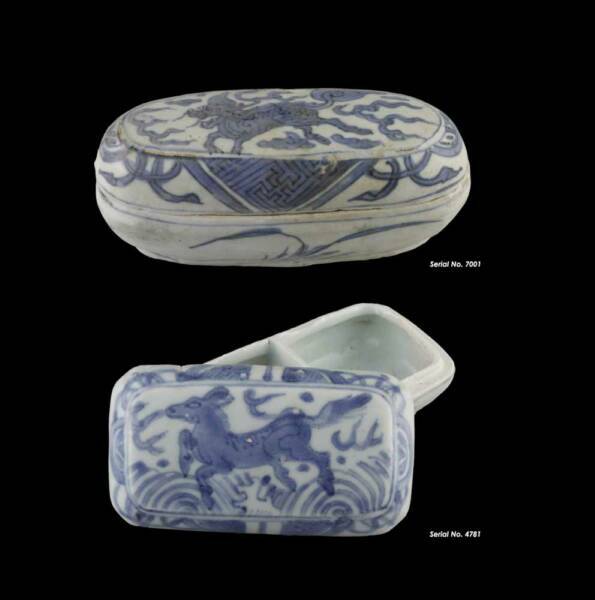 XLIII/2) has two separate articles by Sjostrand and Brown about the mysterious 16th century Xuande (1425-1436) shipwreck (circa 1540) and its ceramic cargo of 250 artifacts comprising antique Chinese and Thai porcelain. Two decades earlier, he co-wrote an exhibition catalogue in Swedish, Treasures from Sunken Ships with Professor Jan Virgin from the Far Eastern Antiquities Museum in Stockholm, Sweden, in 1977. Seen in retrospective, his portfolio of writings demonstrate his dedication to accounting the historical circumstances and providing many first-hand photographic images of the series of ancient shipwrecks recovered in Southeast Asia. Taken as a whole, his published works are nothing to scoff at as envious academicians would have it but can even be deemed admirable for being so meticulous, substantial and thorough. If The Wanli Shipwreck and and its Ceramic Cargo is not to be regarded as academic, then readers are fooling themselves. Publishing this book, however, is not the be-all and end-all of Sjostrand’s life-long work in the field of marine archaeology. Today, he welcomes visitors to his head office in Kuala Rompin, Johor. Although it is in a rather isolated area of Peninsular Malaysia, you are rewarded by the enthusiasm he shows for his work and passion. He enjoys sharing his knowledge and putting things in historical chronology and relating them to facts, figures and material evidence. Overseas readers can even query him and/or buy this book online by going to www.mingwrecks.com. This slim paperback (which is still readily available for purchase from the University of Bangkok's SE Asian Ceramics Museum) is a delightful "case study" of the world of marine archaeology. Turiang was the name given to a shipwreck found on May 13, 1998 in the South China Sea, not far from Singapore. (One of the charms of this volume is it explains so many basic concepts in marine archaeology--these Asian ships were probably unnamed, but it's the habit of the marine archaeologist who found her to name his finds after their cargos--this one was carrying a large amount of Thai ceramics, so Sten Sjostrand named it after one of the ancient names given the kiln site where many of the pots originated from.) The author then narrates the ship's history and poses the questions ceramics historians hope to have answered from such finds. 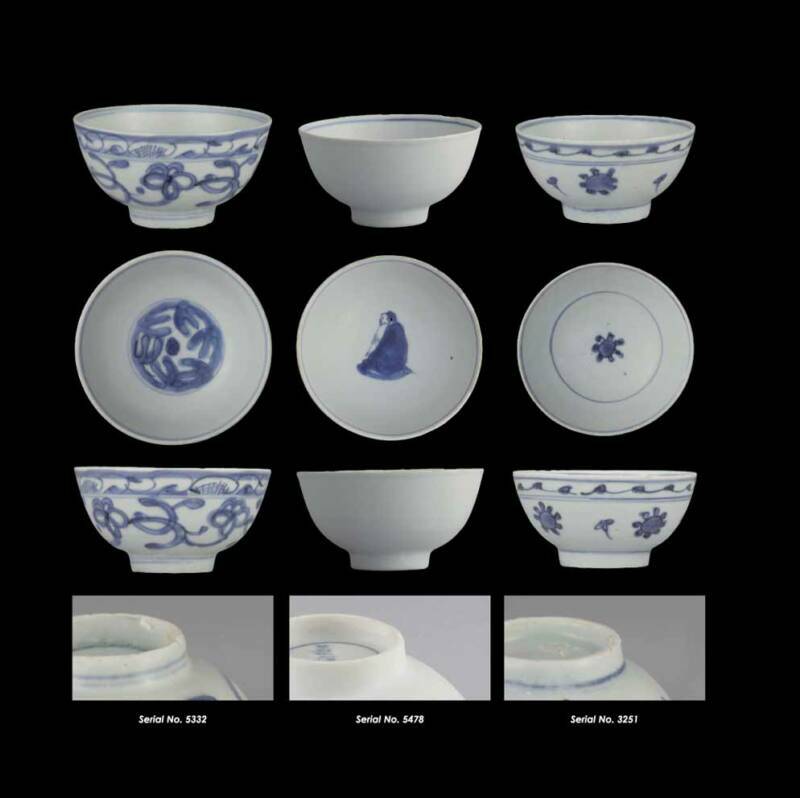 For example, the wreck is dated 1305-1370, a period when there are still unanswered questions as to what type of ceramics China was producing, Vietnam and Thailand. All three types of ceramics were found onboard, and the styles and variations help us date the wreck--along with the presence or absence of iron nails, just to name one example. 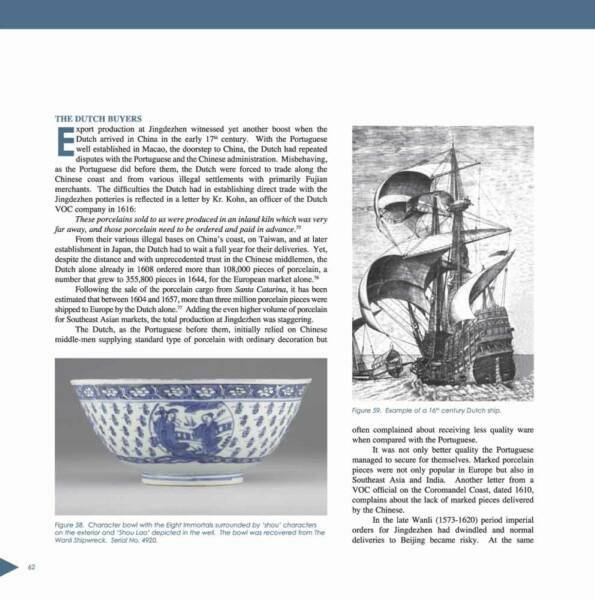 While I am personally very interested in Chinese and SE Asian ceramics, this book would be enjoyed by anyone interested in knowing more about marine archaeology or SE Asian or Chinese ceramics, and how shipwrecks can provide the answers to long-standing historical questions. 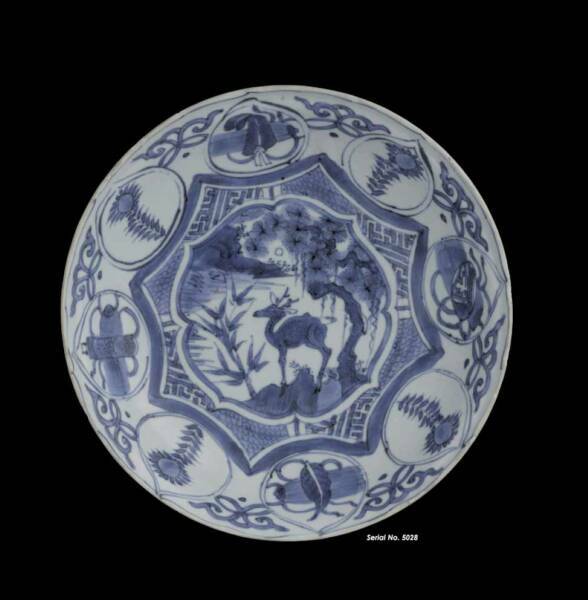 When was blue & white ceramics first produced in China? When was it first exported from China? Did Chinese traders try to circumvent prohibitions against ocean-going ships by using made-in-SE Asia ships? 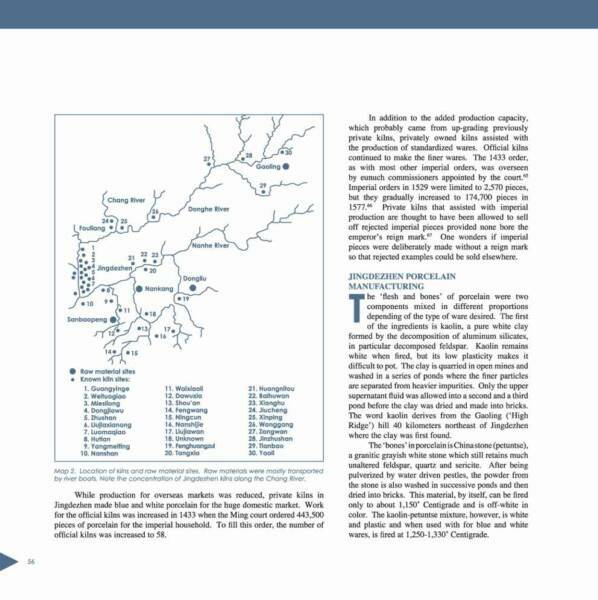 For good measure, the authors include information about three additional shipwrecks in Asian waters: the Nanyang, Longquan and Royal Nanhai. Fascinating. Scholar or armchair archaeologist, this is a delightful and well-illustrated volume for anyone interested in history or archaeology, Asian history or the evolution of ceramics. 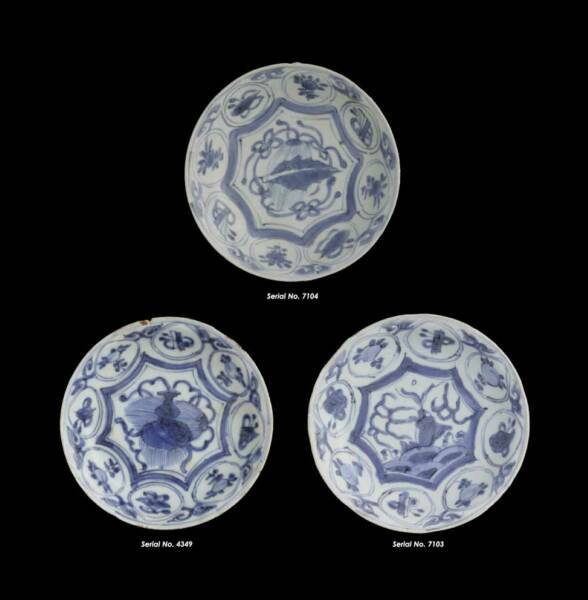 A FORTEENTH CENTURY CHINESE SHIPWRECK UPSETTING SOUTHEAST ASIAN CERAMIC HISTORY. 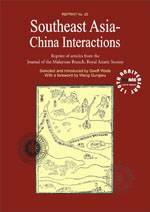 This article is a part of of the monograph: "Southeast Asia-China Interaction" which was published by The Malaysian Branch of the Royal Asiatic Society. in 2002. 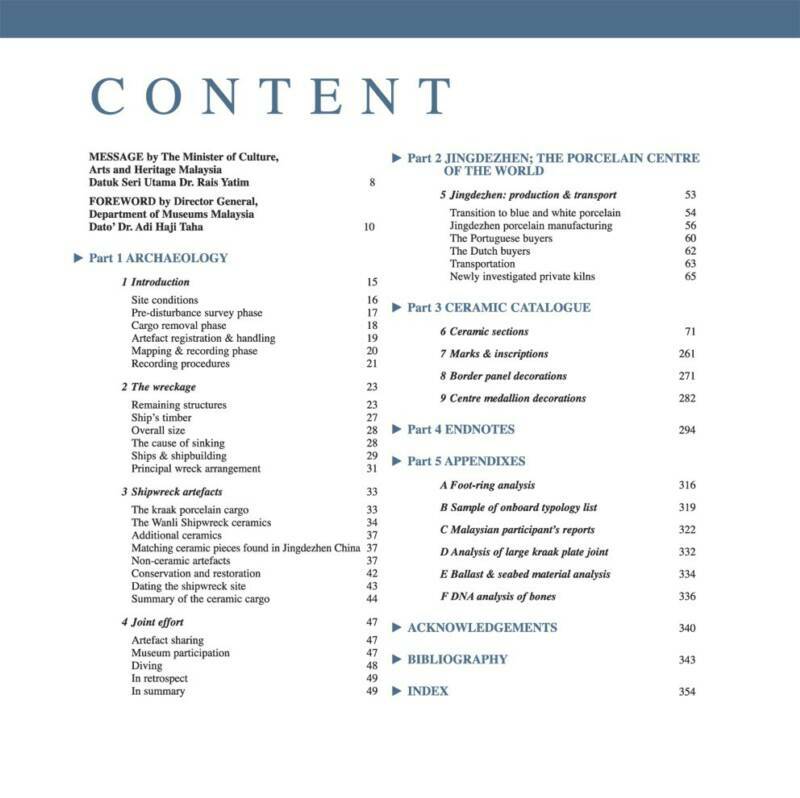 The various articles were selected by Dr. Geoff Wade with the foreword written by Wang Gunawu. Our article is written by Sten Sjostrand and edited by Claire Barnes. 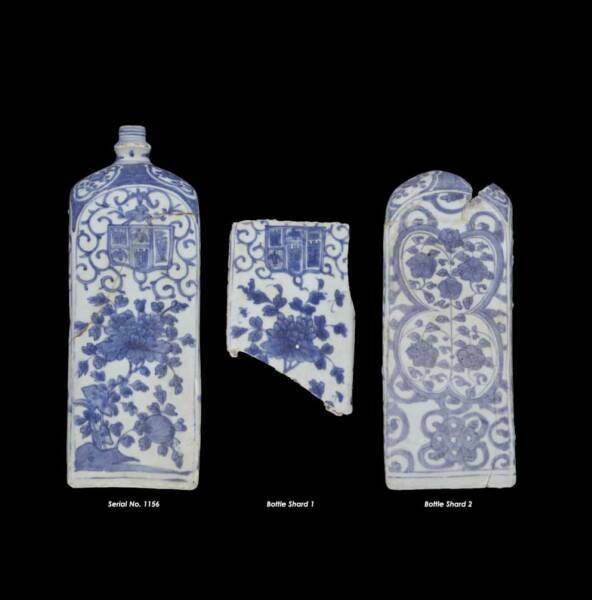 The Wanli Shipwreck and its Ceramic Cargo. 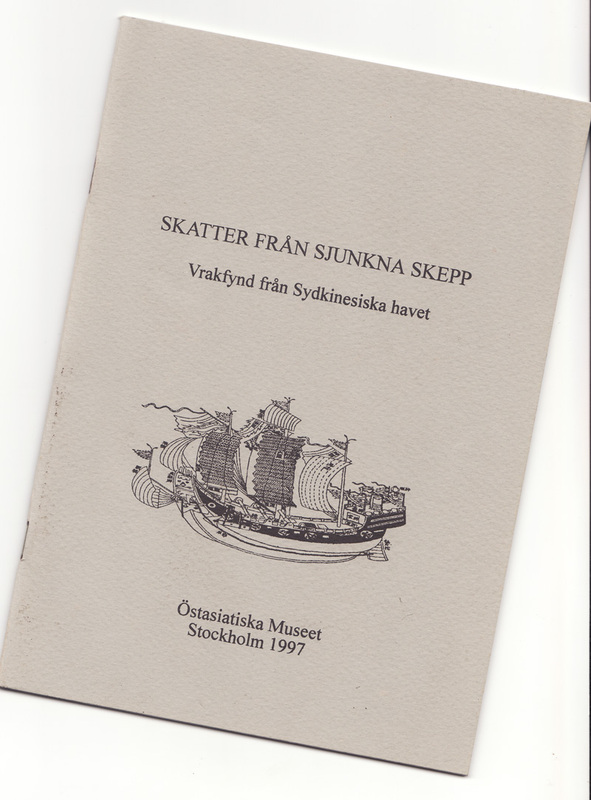 A booklet for an exhibition of the 14-16th century shipwreck artefacts held at the Far Eastern Antiquities Museum in Stockholm. 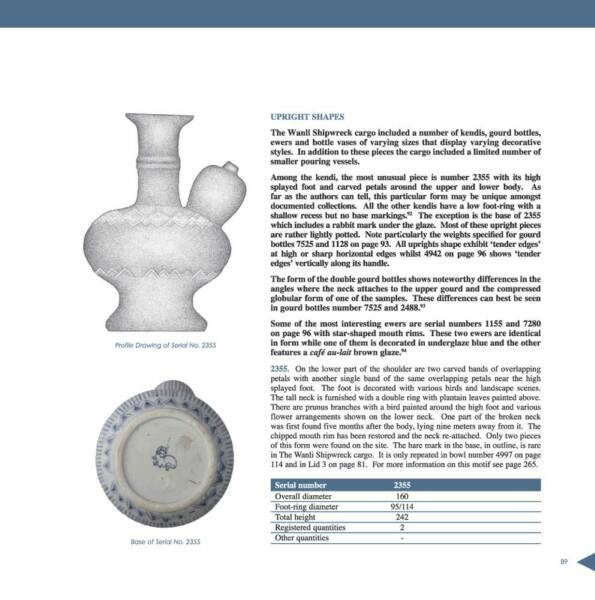 The booklet which is written by our Sten Sjostrand is briefly describing 14-16th century maritime trade and ceramic developments. Foreword by Professor Jan Wirgin. sketches, drawings and other illustrations.